As out-of-home advertising moves toward digital infrastructure and programmatic buying, speculation is rising that the time is ripe for the entry of a major tech player. A German newsweekly, WirtschaftsWoche, reported that Google was talking with German officials to introduce an advertising product for roadside billboards and other outdoor displays. Google has denied that report, but to advertising experts, this move would be a logical next step for the digital advertising giant. 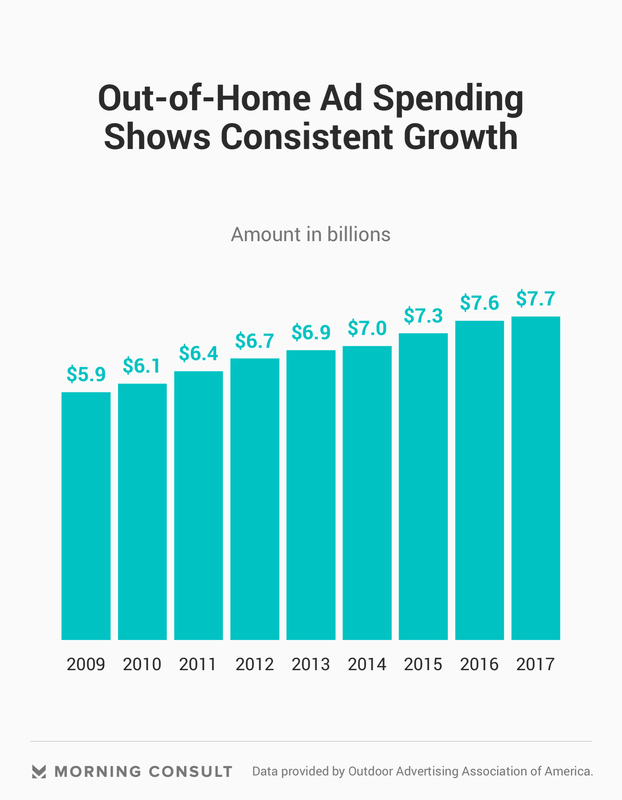 According to a Business Insider report, Google tested a programmatic ad buying platform for out-of-home advertisements in London back in 2015 through its DoubleClick offering, which has since been rebranded as Google Ads. But one privacy advocate raised some concerns with how Google might collect and use data to determine ad placements. The German report said a Google Chrome Enterprise employee presented a product in April that would allow Google to expand its ad business to digital screens in public spaces, such as those found at train stations, shopping malls or retail stores, to agencies and media companies, and that the company had plans to take that same technology to the United States and Britain. In an email to Morning Consult on Tuesday, Google denied the WirtschaftsWoche report, saying that such a product doesn’t exist and that the presentation by the Chrome Enterprise employee had nothing to do with Google Ads or DoubleClick. When asked if Google was thinking about going into the outdoor advertising business, the company declined to confirm any plans. 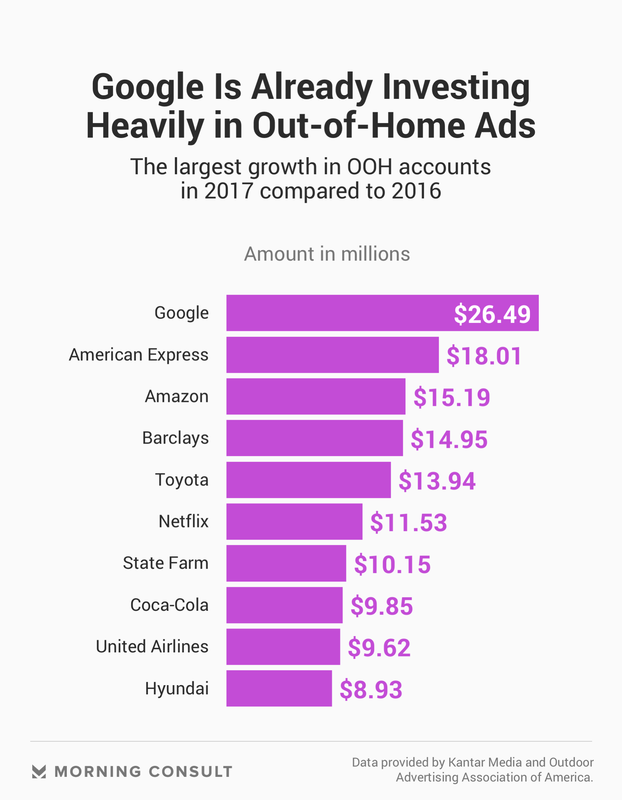 If Google decided to enter the market, it could offer its digital advertiser clientele the option to work through Google’s existing ad exchanges to advertise directly on a billboard or other out-of-home location, instead of having to go through a billboard owner for all of its needs. Ian Dallimore, Lamar’s director of digital innovation and sales strategy, said in the event that a tech giant such as Google were to enter the market, he would see it as another channel where Lamar can sell its inventory. In the past, traditional out-of-home advertising groups would depend solely on public data from the U.S. Census Bureau and similar agencies to sell advertisements based on who lived in a certain region and what the average income was for a location. Now, the industry has begun transitioning to rely more on third-party data providers to share more specific, aggregated mobile data to help advertisers navigate the space. Both Clear Channel and Lamar work with those third-party data aggregators that can supply geolocation and mobile data to help clients understand what demographics will see the ad. At Clear Channel, Jason King, the company’s vice president of corporate communications, said in an email on Monday that the company has been using aggregated mobile location data to help brands get a clearer idea of who will pass by a specific billboard location. Hoban also foresees Google, or similar tech giants, complementing their own user data, whether it be geolocation information from mobile devices or standard web browsing, with the traditional U.S. Census Bureau data to enhance its depth. However, if they did use their own data, Google or other tech companies would not have to rely on the same sort of third-party vendors, which anonymize their data before sharing it, and that could give rise to privacy concerns in the United States. Hoban said location data could be gleaned from Google’s Android operating system, but Google Maps could also provide navigation and geolocation data, as well. But he also stressed that all data at some point starts as individual data — whether it’s coming through a third-party data supplier or directly through Google. “I don’t foresee this as being something where there’s a billboard targeting you as you’re driving down the highway,” he said. When asked about the possibility of employing data in this manner, Google said it has no plans to use Google user data to target ads on outdoor billboards. Kang, the international consumer counsel at EPIC, said it’s easy to lose sight of the privacy issues concerning Google, or any tech giant, possibly expanding its ad platform to out-of-home. As for third-party data collection, “the same concerns apply to whatever type of data we’re talking, whatever process is used to curate the content,” Kang said. Rep. Ro Khanna (D-Calif.), whose congressional district is in Silicon Valley, has been tapped by party leaders to draft what’s being called an Internet Bill of Rights, outlining an internet user’s right to data privacy and to appear on the homepage of a company’s website. In an interview on Aug. 16, Khanna said if Google does move into the outdoor ad market, it needs to get consent from users whose data would be aggregated and used in ad placements. Another possible hurdle tech giants could face if they opted to extend their prowess into the out-of-home advertising space is regulations on roadside billboards, which face restrictions from the federal, state and municipality levels as to how a digital billboard ad changes images and how frequently it does change. Despite the potential obstacles, Hoban said the trend of tech companies extending into the outdoor advertising space will continue across the ad industry, with companies like Rubicon Co. Ltd. and TubeMogul Inc. already beginning to offer these technologies.